Russian-born, Dubai-based designer Katya Kovtunovich has transformed the traditional Arabic fabric Sadu into modern, ready-to-wear dresses, Sadu is a traditional method of Bedouin weaving using goat’s hair or sheep’s wool, characterised by geometric and figurative patterns in the colours of red, black and white. Born on the Russian island of Sakhalin, near Japan, Katya Kovtunovich started her own brand in 2010. Katya’s brand is currently based in Dubai and is sold at The Grand Hotel du Cap Ferrat (South of France), Reserve de la Mala (Monaco), Raffles Hotel (Praslin, The Seychelles), Six Senses Zighy Bay Luxury Resort (Oman), Candella Boutique (Village Mall, Dubai) and by private orders worldwide. In an interview with The National, Katya Kovtunovich talked about herself and her brand and the traditional Arabic fabric Sadu that she use in her clothes. 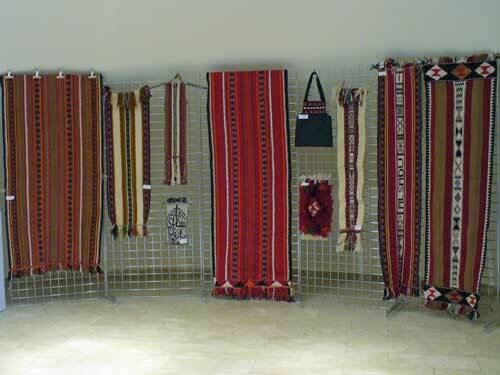 When I first came to the UAE I fell in love with a fabric which I saw everywhere, called sadu. It’s also commonly found in Syria and Jordan. I liked the pattern, the brightness, the beauty – its uniqueness. I thought it would work wonderfully as a coat – especially for the Russian market – as I envisioned its vibrancy against a snowy white backdrop. With the designs having been extremely well received by Russians and Europeans, now, four years later I’m ready to present the concept to the UAE market. How has the local market received the designs? Naturally, it is very unusual for the people in UAE, as the fabric is widely used for majlis sofa covers and tents. Which is why I’ve had a lot of reaction on my Instagram account from Emirati ladies. They send me a lot of smiley faces and comments saying “I wonder if this girl is aware she’s wearing a tent?” I reply to them that “yes, I’m aware and very proud to be wearing it!” (laughs) When I’m travelling, people always stop me and ask me where the pieces are from. That provides me with a great opportunity to promote the UAE, to be its ambassador abroad. It also helps me portray the country as a place that produces new trends and visions. Some people abroad have the impression that we only consume and import here, when actually we do produce things and there’s a great deal of creativity. Your brand has attracted high-profile fans. Tell me about some UAE-based ones? I am extremely honoured that one of my first supporters was Veronica Berti, the wife of Andrea Bocelli. I’m also proud to say that the MBC TV presenter Joelle Mardinian has worn a few of my pieces and she sent me wonderful messages saying that they fit like a glove. Lady Gaga, during her Dubai visit in September, chose five of my designs with sadu as well. I also received a very touching letter from Princess Haya bint Al Hussein for the tunic I gifted to her for Ramadan this year. It was made of chiffon and bore embellishments of sadu fabric around the hem and cuffs. She wrote that she admired my creativity, which for me, meant a lot – I almost cried. Princess Charlene of Monaco has also worn your designs, hasn’t she? Yes, I sent her some beach tunics and she too wrote to me, saying that she would be honoured to wear such beautiful dresses.